"The 11 actors had great chemistry... they interacted as a disjointed bramble of people who have only each other." Anti-heroine Hester Swane (Grace Bolander) channels the murderous Medea in Irish playwright Marina Carr’s By the Bog of Cats (1998). This past weekend, University Theater (UT) performed By the Bog of Cats by Marina Carr, one of Ireland’s most distinguished modern-day playwrights. From the set to the acting, the entire production was wonderfully executed, and the play was an outstanding tribute to UT’s professionalism. Representing the moors of Ireland, the set was vital to establishing the eerie, mystical feeling of the play. 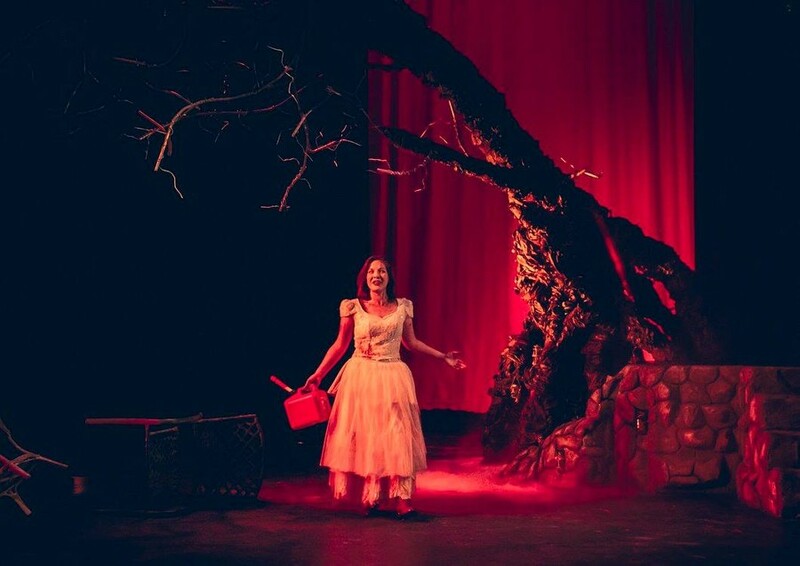 Second-year scenic designer Sydney Purdue did an expert job recreating the bog on stage: the setup featured a massive gnarled tree, ghostly glowing lights, and billows of fog that would roll across the stage and nestle in with the audience. The director, fourth-year Julia Santha, and the designers captured the right atmosphere by surrounding the set with dim lighting and quiet background noises. Entering the theater was like entering another world, which sparked my curiosity before the play even began. I would only change the Irish music played before the actors came on stage in the second act. While it both placed the audience in the appropriate wider setting and prepared them for the Irish accents, it was a little too upbeat. The plot is a re-imagining of Euripides’s Medea, which tells of a woman who, after giving up everything to make the man she loves great, seeks revenge when he pursues a younger woman. Carr complicates this theme by giving her heroine, Hester Swane, psychological issues stemming from her childhood abandonment. It is this fear of abandonment that pushes Hester to fight for the man who no longer loves her, and it is this fear of abandonment that pushes her to take her daughter with her into the afterlife. The town at the edge of the Bog of Cats is small, and all of the characters have secrets. The 11 actors had great chemistry, which showed as they interacted as a disjointed bramble of people who have only each other. Second-year Grace Bolander, playing Hester Swane, was a strong backbone, capturing the heroine’s complicated emotional turmoil while remaining real and relatable. Furthermore, her Irish accent stayed completely on point. Credit should go to third-year costume designer Itzel Blancas, as her designs allowed the actors to fall completely into character and come alive onstage. She showed great understanding of how the social positions and personalities of the characters would translate to their clothing. Furthermore, the costuming and makeup of the character of the Catwoman was a masterpiece by itself. There was not a weak actor in the performance—Santha and third-year stage manager Natalie Wagner cultivated the talent needed to build relationships onstage. Fourth-years Joey Whitaker and Elisabeth del Toro as Carthage Kilbride and his mother created a convincing mother-son relationship. Fourth-year Maxine Frendel in her role of the Catwoman was the perfect balance of eccentricity and wisdom, and third-year Patrick McCarthy as Xavier Cassidy was so proud and twisted that it was difficult to imagine the role going to anyone else. By the Bog of Cats admirably captured the psychological intrigues of a place where everyone is dealing with guilt and sin and no one is coming back to save them. In killing her daughter, Hester Swane takes the life of an innocent—the only innocent in the play—so that she would not feel the pain of having someone taken from her. She wanted to be her daughter’s savior from the world that had destroyed her. Now Hester and Josie forever wander the afterlife, the whimsies of Ghost Fanciers, and we wonder: does she regret it?